Lately I have not gotten too many forwards and that's great. But once in awhile one comes by that is surprisingly enjoyable. Often they are like that old story your uncle tells every year. Yes I've heard/seen this already, stop filling my inbox. I believe there are some people who forward just about everything they get. I plucked this one out of the list and consider it a better one. Sorry if you have seen it (maybe you would like check out some other links in the sidebar). In case you didn't hear about this on the news. A big event in cultural news today. 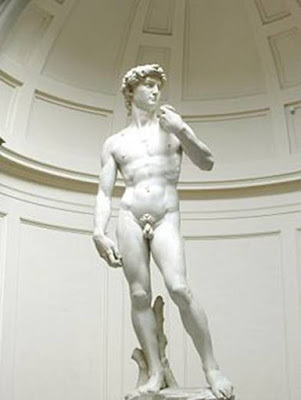 The famous Michelangelo David was on loan to the US. 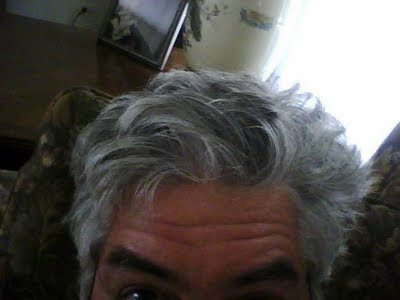 Last fall I posted some pictures from a few forwarded emails. Who did the second sculpture? It is a masterpiece. That's great! I hadn't seen that before! My computer doesn't like it when I post comments through disqus. We'll see if this works or if I get an error message! Oh so true, we eat and eat in America and that means we grow and grow!! looks like it worked ok from here. if you have problems disqus does have a help area. I do know sometimes different software updates that have not been updated can be a problem. thanks leaving this and trying even with past difficulties. It is a great system when it's working. maybe too many ads for food triggering our brains? 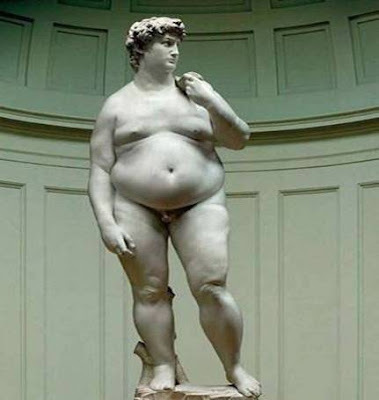 I might be wrong but wasn't fat the "in" thing many hundreds of years ago? Ha! I had not seen that one yet. I guess that means "David" got "Super Sized" during his visit. Hilarious! I love this! I think he can blame it on the American diet or McDonalds! Thanks for the smiles! Hope you have a great weekend! I don't have the excuse of ads triggering my hunger, we don't watch TV. At all. So my only excuse is I like food!! I don't know if we can totally blame Mickey D's for American obesity--I'm partial to chocolate and cheese doodles for my xtra poundage. I get too many of these forwarded things and I've been telling people to stop--especially from the "conservatives" who've been sending me Rush Limbaugh hate-type stuff. I do like the dog-picture ones, though. Talk about STUFFED!!! Great one word! thanks for coming over here and checking this. I really like it when I get comments on older posts. Actually comments on any post is great. Ha! The creativity in this world can really boggle one's mind. THAT was clever. Thank you for participating!! I do hope you'll be back next week at Jillsy's place!